The uric acid diet is not a new fad. There are many components of various diets that fit well for helping people struggling with gout, but there is not a “one-size-fits-all”. A good example is the Atkins Diet; if done correctly, it can produce excellent results but it is typically not a good choice for those with gout – it is essentially a HIGH uric acid diet. We need to be clear on this point: Uric acid is not something you eat, or don’t eat. Foods do NOT have uric acid in them. Uric acid is a chemical that gets created by your body itself and inside your body by the breakdown of purines…and foods DO have purines in them. PURINES in your food are what you want to avoid when we’re talking about uric acid diets. As you can see, these are in order of highest to lowest. So the foods with higher purine content are more likely to create uric acid inside your body…and the foods with lower purine content are less likely to create uric acid. Note that the uric acid producing purines of all these foods are measured per 100 grams. There are 28 grams in an ounce – so 4oz of any of these tasty morsels is basically going to produce the number of milligrams of purines you see on the uric acid diet chart above. 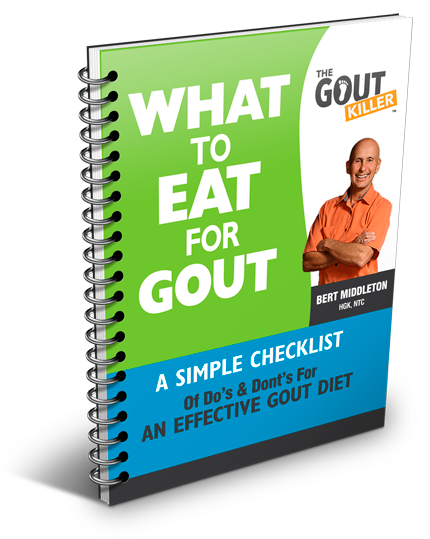 Following a uric acid diet to lower the risk of gout symptoms is definitely part of the kill gout plan, but it’s not the whole story. Knowing how to treat gout naturally is much more than just what is on this uric acid diet chart. One more time, having a low uric acid diet is one important part of killin’ gout (and there’s more to it) but let’s get this one dialed in. 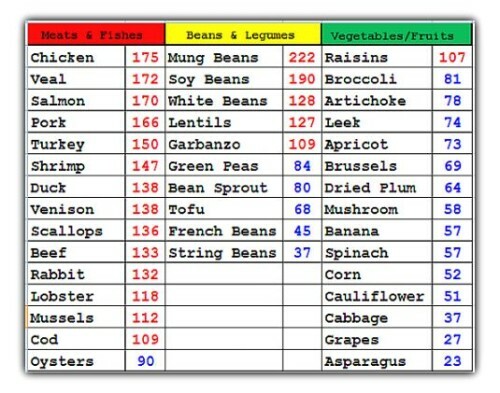 As you can see from the chart, meat sources and beans, i.e. proteins, tend to be the higher sources of purines . 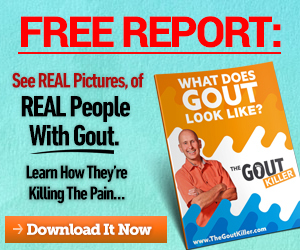 . . the opposite of what we’re looking for – a uric acid diet to reduce the risk of gout symptoms. Surprised to see how high in purines beans are? Moving over to the other side of the chart, as you can see, fruits and vegetables give us more of the lower uric acid diet we want. I purposefully left several of the high-purine foods off the chart. From all my research I found there are a small percentage of people out there eating ox livers, pigs spleens, and calf’s lungs…not that they’re not out there, but they don’t appear to be very mainstream. This is important – organ meats, what they make sweetbreads out of, (I guess) are super-concentrated sources of uric-acid-producing purines…if you come across them, stay away or at least be cautious. Another thing that should be on the chart that qualifies as part of a high uric acid diet is…sausages – in commercial applications they grind up low-quality animal parts and stuff them into the sausage casings (those condom-like things – originally they were cleaned intestines). This represents a high concentration of purines, and in eating them, a monster-size gout attack is likely to descend upon you. For a fruit smoothie, take some bananas, frozen strawberries or cherries, a raw egg, oat milk, and some whey protein powder. Put all of that into the blender, grind it up really well, and chug. After you’ve got yourself on track, as an option you can spice it up with a spoonful of raw cocoa powder and/or a small spoon of raw honey or REAL maple syrup. When you’re going for granola and yogurt, buy high quality ingredients – really good organic granola with a lot of nuts in it and plain, raw whole milk, or certified organic yogurt. Mix up a nice big bowl with a lot of fresh or frozen blueberries or cherries. As for the vegetable omelet, first sauté a little broccoli, asparagus, and some mushrooms – it doesn’t take much. Then whip up three eggs and some certified organic cream. Lay down the eggs/cream in a nice hot pan, fold it around a little bit (this is an art, it takes practice but you can do it) then lay in the veg and mushrooms. A nice little pile of certified organic raw sharp cheddar cheese goes on top of that, and then fold it up and finish it off. Top with slices of a half an avocado and a little more cheddar cheese and that is a great way to start the day on a uric acid diet plan. Lunch – Roll-Ups, Salads, Beans and Rice. Roll-ups are an easy way to get healthy. Use some chard, kale, or lettuce leaves (organic of course) and roll up some high quality ham, chicken, or turkey slices in them. Get creative – use some stone ground mustard, some bits of hot peppers, spices like cayenne and turmeric, and preventing gout won’t be all that bad. Add some slices of apple and celery on the side and killin’ gout is a breeze. Salads – salads are an easy way to get creative and get full. Start here – red lettuce, celery, apricots, apple, garbanzo beans, tomato, avocado, almonds, and fresh sprouts – use mostly the lettuce and a little of everything else. Keep it simple – pour some high quality olive oil over it all, then some apple cider vinegar, a dash of sea salt and some black pepper, a sprinkle of cayenne and turmeric and…I’m hungry – I think it’s lunch time! For the beans…since they take forever to cook from scratch, go a get a can of organic pintos or black beans to make things easier. Rinse and strain them, put them in a bowl, and mix with some olive oil and a few shakes of chili powder, cayenne and sea salt. To put it all together, lay down a small bed of rice in the bottom of a big bowl, then add a huge heap of steamed broccoli, then some of the chili beans (not too many because of the purines) then top off with chopped up avocado, red bell peppers and the juice of a whole lime. Sprinkle some grated raw cheddar cheese over all of that, and lunch is served! Dinner – Chicken, Salmon, Tofu. Here we change the game a little bit – on this low uric acid diet, we go a little easier on dinner. You can mix and match and change this up any way you see fit. The grilled chicken, grilled salmon, or pan-fried tofu are all interchangeable – remember: 4 – 6 oz at the most! Option 1: Salad. Just like lunch, get creative and pair up a really tasty salad with the chicken/salmon/tofu choices. Use Tamari sauce and spices to change the flavors from one meal to another. Option 2: Steam or stir-fry vegetables. Steaming usually involves just one or two vegetables like broccoli and carrots – clean and simple. With the stir-fry you can really turn your “inner artist” loose and start with some coconut oil, garlic and onions, peppers, bamboo shoots, water chestnuts, and the whole wide world of all the rest of the vegetables. Get the wok (skillet) nice and hot and let that uric acid diet plan come to life! A few of things that I didn’t get on this uric acid diet list for you are oat milk, organic plain yogurt, raw cheddar cheese, and grated Parmesan cheese. Dairy is an important part of rounding out a complete gout uric acid diet but I didn’t want to distract you with a complete category of it and make too big a deal of it. It’s also worth mentioning that if you can, get yourself some organic, whole, raw cow or goat milk (if it’s available in your area). It is a very complete and nutritious source of protein, and vitamins and minerals. Studies like these referred to in the New England Journal of Medicine have shown that high quality dairy decreases risk of gout. I know you don’t know me and I wanted to thank you for your time, your efforts, and suggestions in helping me overcome this and hopefully ending these flare ups once and for all. I truly appreciate everything you are doing for me. To recap: Uric acid is the substance that actually crystallizes in the joints and causes all the pain and swelling of a gout attack. Learning that purines in foods turn into uric acid is an important part of knowing what to do about gout, how to treat gout, and how to eat to avoid gout attacks. 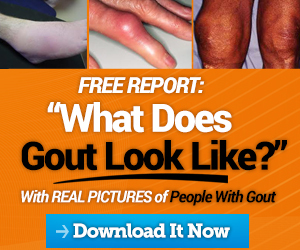 However…eating the perfect uric acid diet will NOT (all by itself) get rid of your gout. Learning about cellular health and alkalizing (neutralizing acidity) is far more important than getting obsessed with a uric acid diet. ☆ Remember! Getting a uric acid diet figured out is only one part of the gout puzzle. 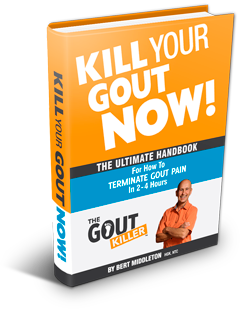 This and the rest of the puzzle can be found in my handbook: Kill Your Gout NOW!